On March 29, Speexx will attend the eLearning Network’s LT Awards Showcase event for the winners of 2018’s Learning Technologies Awards. 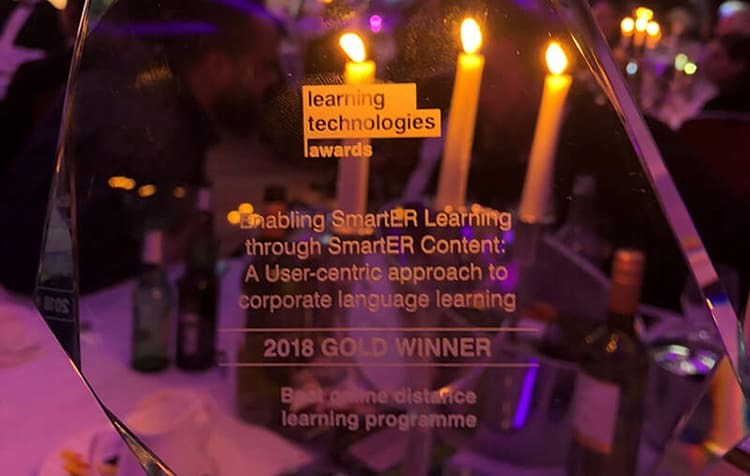 The event is held in London, where Speexx presents its award-winning language learning solutions, discusses the challenges facing the e-learning industry today and explains how it overcame these challenges to win Gold for Best Online Distance Learning Programme. The LT Awards Showcase is an all-day event during which participants will have the opportunity to meet and talk with representatives from six different award-winning organizations, diving into best practice examples and insights on what it takes to build effective learning solutions. ”We are the first intelligent language learning solution for the workplace and there are lots of one-size-fits-all solutions out there, but what we are doing is bringing learning to scale and using data to further personalize the learning experience at a user level. We are really focused on helping our customers run their systems with IT integration, HR analytics and we use the same kind of data to provide them with more insight. What we can actually bring to the market is inside analytics for a whole population of users across different locations,’’ said Speexx’ President and co-founder, Armin Hopp, who will be in attendance on March 29. The annual awards event is hosted by Learning Technologies and is the perfect opportunity to formally recognize the most effective solutions available worldwide in the e-learning industry. The internationally recognized awards are open to e-learning organizations of all sizes and are rigorously judged and upheld to the highest standards by a panel of established experts in e-learning and L&D. Join us in London to learn more about the challenges facing the e-learning industry and how these award-winning solutions can be applied to your L&D and e-learning projects. The eLearning Network (eLN) is a not-for-profit, Community Interest Company run by the e-learning community and serving the learning community. The eLN is a trusted source for guidance on best practice and future trends in technology-based learning and development at work, with hundreds of members located internationally.